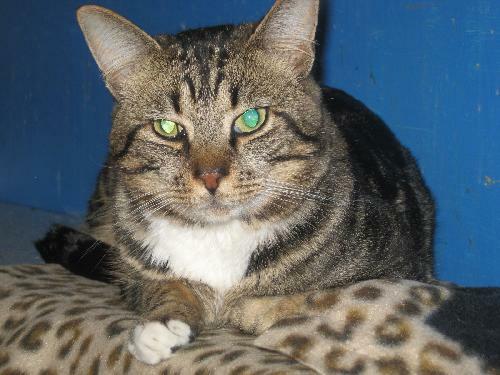 Timmy came to us as a small kitten from the feral barrel @ CCAS. He was so tiny w/o a mother, he could eat dry food on his own and canned. We have never been able to touch him but he gets awful close to you sometimes. He watches you with both eyes, you get to close, he is gone. A feral that has adjusted to life indoors, he doesn’t know any other kind of life. He would like a home of his own, he would need quiet, patience and lots of love. This guy would do best in environment that was peaceful.